Material on this web site copyright © 1995-2006, TelePost, Inc. All rights reserved. LP-StepLink is a freeware application that gets transmit freq data from TRX-Manager through OLE or Commander from DXLabs through DDE, and then relays it to the SteppIR control box by "emulating" a Kenwood radio over a computer serial port. This allows connecting any rig supported by TRX-Manager or Commander to SteppIR with a consistent interface, and at the same time allows computer control and logging. The antenna tuning follows freq adjustments either at the rig, or from the logging program. This program can run in the background, and the only input from the user is to specify the com port the SteppIR box is connected to and the source program for frequency. LP-StepLink works with any SteppIR antenna including the verticals, and MonstIR. All that is required is a 3-wire female-to-female null modem serial cable and a spare COM port on your computer. Shown below are LP-StepLink normal and setup windows. For more information, check out....LP-StepLink Help. LP-StepLink ver. 1.1 is available for download on the Downloads page. SteppIR Virtual Control Panel (for old controller). Scroll down for information on SteppIRVCP for SDA100 controller. There are three "views" available for the program. The compact view shown above, the diagnostic view that's shown below and a full view that looks like the diagnostic view without the Received String window. The diagnsotic view shows the hex responses from the controller for troubleshooting. To keep things familiar, I chose to copy the basic SteppIR controller with a few exceptions. Because of the way commands are implemented, I was able to change the 180 and Bi-Dir to two separate buttons to eliminate the need to cycle through Bi-Dir when reversing the beam. I also used a more visible red TUNING indicator as opposed to an asterisk. 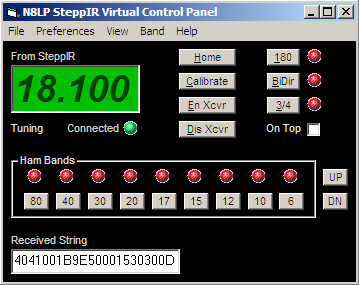 The SteppIR VCP always shows the current status of the SteppIR it's controlling. When new frequencies are sent to the controller, or when functions such as 180, Bi-Dir and 3/4 are sent, the status LED indicators only change when the command has been received and accepted. The Setup screen allows selection of com port, baud rate, status polling rate and antenna type. The antenna type determines the allowable tuning range of frequencies sent to the controller. When sending frequency data to the SteppIR controller's DataOut port, strange frequencies can wind up being displayed if they are outside the controllers design range. No SteppIR currently tunes 80m, but a future option for the BiggIR will include this feature. For more detail, check out the N8LP SteppIR VCP help file. To download the SteppIR VCP go to the downloads page. SteppIR Virtual Control Panel for SDA100 controller. Norm, 180, BI, 3/4 are implemented differently to echo the changes to the SDA100 front panel. There are now two sets of Up/Dn buttons. One for 50 kHz steps and one for 10 kHz steps. The Antenna Type selection on the Setup page has changed to allow selection of minimum frequency for your antenna (80m, 40m, 20m). VCP can be used simultaneously with a transceiver interface now, but keep in mind that any frequency commands from VCP will be overriden by the transceiver. Home... Retracts the elements and turns off Xcvr Interface. To restore, turn on Xcvr interface. If connected to a rig, the beam will tune to the rig's frequency. If not, select a band button on VCP to tune to a band. If operating remotely, be sure to leave about a minute for this process to complete. The Tuning indicator will return to normal when complete. Calibrate... Performs calibration sequence. If operating remotely, be sure to leave about 2 minutes for this process to complete. The Tuning indicator will return to normal when complete. AutoTrack... Allows the controller to accept frequency data from VCP or the rig. Controls the AutoUpdate mode on the SDA100. ManualTrack... Blocks the controller from receiving frequency data from VCP or the rig. Controls the AutoUpdate mode on the SDA100. Norm... Switches the direction to Normal. 180... Switches the direction to Normal. 3/4... Switches vertical to 3/4 wave mode. Band Buttons... Tune directly to the center of the chosen band. UP/DN Buttons... Fine tune the antenna in 50 kHz or 10 kHz steps.